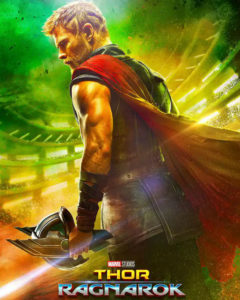 Two years after the Battle of Sokovia and his unsuccessful search for the Infinity Stones, the mighty Thor returns as he sets out to bring balance to Asgard after finding his adopted brother Loki has taken over the throne, while the goddess of death Hela sets to overthrow it. After he is imprisoned on the other side of the universe, the god of lightning finds himself in a deadly gladiatorial contest against former ally and fellow Avenger, Hulk, while attempting to free them both. Teaming up with old and new allies, Thor’s quest for survival leads him in a race against time to prevent the all-powerful goddess from destroying his home world and the Asgardian civilization. What makes this film stand out, aside from its very colorful sets and cinematography, is its humor, comedic timing and colorful cast behind the film. The final installment in the Thor trilogy is clearly the most amusing and entertaining to date. Director Taika Waititi himself stated 80 percent of the film was improvised which is displayed in the performance of each actor having worked on this film and having fun with it. As the “less popular” members in the Avengers, this film also does a fantastic job redeeming and further developing Thor and Hulk’s characters as both superhero’s struggling with their inner human. The film not only provided a fresh take on the super-powered demigod and green monster, but it did so by not having these characters become overshadowed by their more popular allies (aka Captain America and Iron Man) by giving them their moment in the spotlight. Seeing these two characters working together is also something the audience has yet to see in the MCU (Marvel Cinematic Universe) and it works well—much to the movie’s favor. The entire cast, including new and supporting characters, are all quite likable. Definite standouts are Tessa Thompson, introduced as the tough, hard-drinking bounty hunter Valkyrie and Cate Blanchett as Hela, with their no-nonsense and snarky attitudes. Fun and action-packed, Thor: Ragnarok is a welcoming and colorful addition to the Marvel franchise that fans will thoroughly enjoy. Tom Hiddleston reprising his role as the god of mischief Loki is an audience favorite and once again proves he can do no wrong with this role. The eater eggs from previous and future Marvel films were also a nice touch. While a very likable film, Thor: Ragnarok still had its problematic scenes. The opening sequence (in my opinion) was just a little too choppy and the ball didn’t quite get rolling until a certain superhero cameo appeared on screen. While the film was hilarious, there were times it did not know how to take itself seriously. Rather than engaging in a serious moment, the film would instead play it off as a joke. There could have been more buildup and focus for these scenes. But regardless, it is still a really good film. Just not great.